Lately, I've been inspired by classic 1960s fashions. Sleek silhouettes, bold lines and simple staples make for effortlessly chic outfits. Today we take 10 lessons in style from 1960s star, Audrey Hepburn. Her film costumes like the black dress in Breakfast at Tiffany's and fabulous dress in My Fair Lady have become ionic over the years but its her personal fashion choices while off the set that has never gone out of style. Will soon be available as an art print in my etsy shop! Audrey softened her look and made her eyes the main feature with beautiful natural brows. It's easy to go overboard with the tweezers but a full brow can be so sophisticated. Audrey had such a lovely, slender figure and a waist to envy. She showed it off with a cinched belt, sweet little play suits and form fitting pants. Create the look of a smaller waist with a full skirt and tucked in blouse. Audrey really paid attention to doing one or the other. She played up her eyes and kept a soft lip and Wore tailored clothes with no-fuss hair. Audrey was an expert at choosing just the right accessories. When off the film set, she usually went with one big statement piece like over-sized sunglasses, a really fun hat or bold color blocking. whether in pants or a feminine dress, she always looked really relaxed and comfortable with herself because she knew that confidence was the most important accessory. Always choose clothes that make you feel good, inside and out. What a great post! 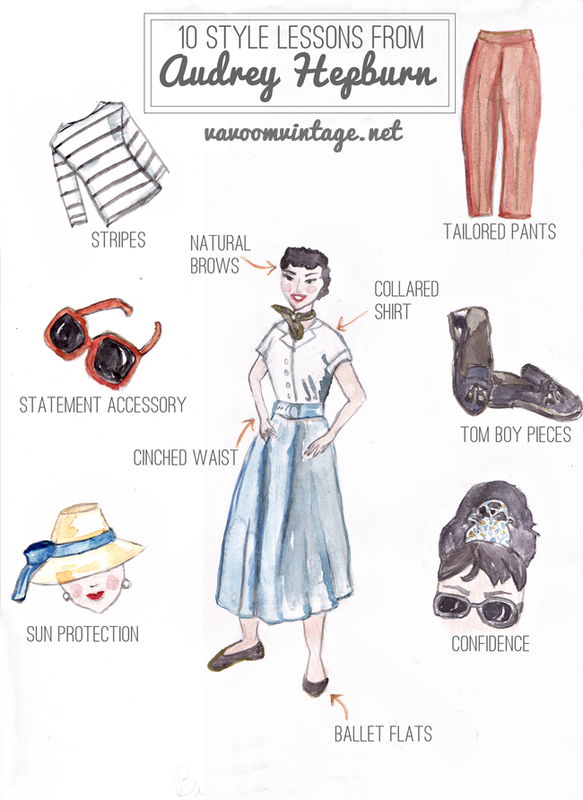 Your art is lovely, and this is a great tribute to Audrey Hepburn's style! Just love her, she's the "real deal!" I agree that one of her most important fashion elements was confidence! Really lovely post, I have always admired Audreys style! Really, really charming, fun post! I too have felt a pull toward early, classic 60s styles with strongly feminine notes to them in recent months, so this post couldn't be more up my style alley. I, too, have been drawing a lot of inspiration from Audrey lately! She's always been one of my favorites, sporting such a timeless and universally lovely look. She never did anything too over-the-top or "trendy" and that's definitely part of the reason we still look to her. Great post, and I LOVE your print at the top! Audrey is one of those stars that will never go out of fashion. It's amazing how fresh and modern and classic practically any photo of her feels, year after year. I love this little roundup - it's making me want to throw on a striped shirt and loafers and go make friends with a baby goat. I love your watercolor! I've been taking style cues from Audrey lately too, and several of these points are things I'm doing or working towards right now. Ironically as I type this I'm wearing a striped shirt with trousers and loafers, lol. Her style is so classic! I used to think I needed to wear heels to feel feminine. So, after my back injury, it really hit me hard that I was/am no longer able to wear heels. I now own ballet flats in every color I have found and am still able to feel feminine in them. Audrey's style is such an inspiration. I love the play between masculine and feminine. She was a true style genius. Love this post and your adorable illustration! Ballet flats are my favourite style of shoe, since I'm a bit clumsy for heels most of the time, but still want something pretty. I've always admired Audrey; maybe it's time I actively took some tips from her as well.